If you’re looking for the best pizza in the Uptown neighborhood of Dallas, then you don’t have a huge number of options to choose from. But the good news is that you don’t need a lot of options, because the best pizza of Uptown might also be the best pizza in Dallas. Grimaldi’s Coal Brick Oven Pizzeria is a chain, so let’s get that out of the way right at the beginning. It’s a small chain, and it’s NOT a franchise. The chain is privately owned. They originated in New York, and have restaurants in New Jersey, Arizona, Florida, Nevada, South Carolina and here in Texas. What makes Grimaldi’s different than other pizzerias is their coal-fired brick pizza oven. They don’t use gas. They don’t use wood. They don’t use confection. They use a special type of coal that they only get from Pennsylvania. 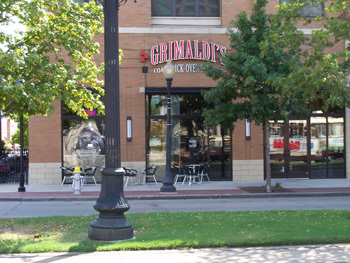 Grimaldi’s is a thin crust kind of place, so if you’re looking for deep dish pizza, this is not the pizza place for you. They are located in the West Village shopping center on McKinney, about a block behind Brooks Brothers. 3636 McKinney Avenue. What are the other pizza choices for Uptown? Here’s the rundown. Coal Vines is also a high end pizza place, with limited, tight seating. It calls itself an Uptown Pizza Wine Bar, and the wine selection is indeed very good. Like Grimaldi’s, the pizza is a New York style of thin crust pizza. This one is my number two pick for the best pizza of Uptown. 2404 Cedar Springs Road. i Fratelli Pizza is a local chain, with about nine locations around Dallas and Fort Worth. i Fratelli also delivers. With a strong four star average review on Yelp, the pizza is good. The chain has been around since 1987, so you know that they’ve been doing something right. Located where Allen hits McKinney, near the Starbucks. 2815 Allen Street. The Union Bear is also located in the West Village shopping center, but close to Starbucks and Taco Diner. Well reviewed in Yelp with four out of five stars and more than 100 reviews, it’s also a good choice for quality pizza. And it is a local establishment, if you prefer to avoid chains. It’s also a bar, and describes itself as “Eats and Drinks in the heart of West Village.” 3699 McKinney Ave, Ste C306. Rocco’s is also New York style pizza, made in a brick oven. It is a local establishment, and was voted the best pizza of Uptown in 2008 by Citysearch. Rocco’s delivers all over Uptown and Downtown, and they are open until 4 a.m. on Friday and Saturday night. This one is not one of my favorites, and the Yelp reviews seem to agree with a 3 star average rating. They are located near Baker Brothers and the Dream Cafe. 2717 Howell, Suite A. Did I miss any good pizza establishments in Uptown? Do you have a different opinion of what’s the best? Leave a comment and share your feedback with everyone else.